If you walk into any drugstore, you'll find an aisle full of shampoos and conditioners. But ultimately, these are all still one-size-fits all solutions. The actual amount of variation among each product and brand is quite small, and many consumers shop around for years trying out different haircare products without finding one that really works for them. 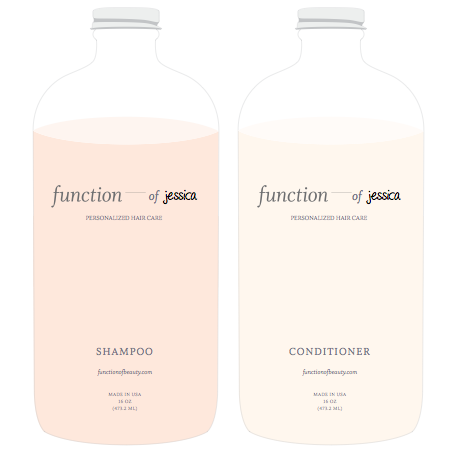 Function of Beauty is a startup launching out of our Winter 2016 class that creates truly customized haircare products. Founded by two MIT grads, computer scientist Zahir Dossa and engineer Joshua Maciejewski, along with cosmetic chemist Hien Nguyen, Function of Beauty has built a software platform that allows customers to create a personalized profile from 36 different features, encompassing options regarding hair type, style goals, fragrance preferences, and more. Ultimately, the company says that its platform can be used to create more than 450 million unique end products. "For now, the team is hand-filling each bottle and using a software algorithm to determine ultra-precise formulas for both the shampoo and conditioner. Eventually, however, Function of Beauty will use an advanced robotics machine to automate the creation of each formula and fill the bottles. Beyond formula customization, the company also offers the ability to name your specific formula, with that custom name printed right on the bottle. ...Function of Beauty keeps prices relatively low by selling directly to consumers online. An 8oz set will go for $26 and a 16oz set goes for $38. Comparatively, low-end products like Suave will cost you around $10 to $15, whereas high-end products like Fekkai shampoo and conditioner can cost up to $50/set." We're excited to announce the launch of The Macro, a new publication that will feature essays, interviews, research, and opinions from Y Combinator and the wider startup community. Y Combinator’s mission is to enable more innovation in the world. Historically, that’s mainly meant funding and advising startups. But from the beginning, storytelling has also been a core part of YC's DNA. From Paul Graham's essays, to Jessica Livingston's book Founders at Work, to the more recent Female Founder Stories series and Sam Altman’s How to Start a Startup class, a big part of what has made Y Combinator special has been the stories it has helped create and the way that it has shared those lessons with the world. As YC has expanded, so has the amount of stories to share. The Macro is the latest part of that tradition. The Macro is not focused on breaking news. There is already a robust network of publications that are covering the day-to-day changes in the technology industry. Our aim is take a wider-range view1, while sharing information that is useful, thoughtful, and interesting. In the latest episode of YC's Startup School Radio, a podcast that features stories and practical advice about starting, funding, and scaling companies, our host Aaron Harris first sat down with his fellow YC partner Michael Seibel, who talked about his experiences co-founding Justin.tv/Twitch and Socialcam, and his work traveling around the world meeting startup founders. In the second half of the episode he interviewed Wade Foster, the co-founder of app integration platform Zapier, which launched out of YC's summer 2012 class. You can hear the episode in its entirety on SoundCloud here and on iTunes here. Aaron Harris: You've traveled all over the world meeting founders. I think you've probably traveled more widely than almost anyone I can think of in terms of meeting founders in different places... Are there different signs that you see in other places that aren't the valley, that are good indicators of people being committed and passionate? Michael Seibel: You know what's really interesting? When I meet founders across the board in the States and outside of the States, I basically feel as though the ones that I'm really impressed by are the ones that don't let anything get in their way. And whether fortunately or unfortunately, for international founders, oftentimes, especially for startups, that means finding a path to America. Aaron Harris: Interesting. Because there's more funding here? It's more accepted here? What is that? Michael Seibel: There are two things I did not realize this about America until I left America. First of all, the terms and the amount of money available in America is massive. Aaron Harris: And by "terms" you mean? Michael Seibel: Meaning founder friendly terms for funding, for terms that don't deep-six your company from day one. The number of funds that can actually write a $10 million check on Sand Hill Road, just one road in Silicon Valley, is more than the number of funds that can write a $10 million check in all of Italy. And I bet that number's actually most countries in Europe. So that's the first thing. The second thing is America has a huge population that all speak the same language with the same culture. Michael Seibel: Well, it's about life. We have one founder from Colombia who, when he was growing up, there was violence. We had one founder who grew up in Croatia during the Balkan Wars. Aaron Harris: Where half the country was leveled. Michael Seibel: I mean, literally, I remember I was in Croatia visiting a founder and he told me this story about how up there in the hills somebody had a gun and was shooting down on this little valley that we were standing in. That was his life memory. So, yeah, they are tough. Aaron Harris: And I think when we look at companies, one of the things we're trying to identify most is toughness. New Story, the nonprofit that recently launched out of our Summer 2015 class that crowdfunds the building of new homes for families in need, rang the opening bell at the NASDAQ stock exchange in New York City last week -- marking a big milestone for the company, and a first for a YC nonprofit. 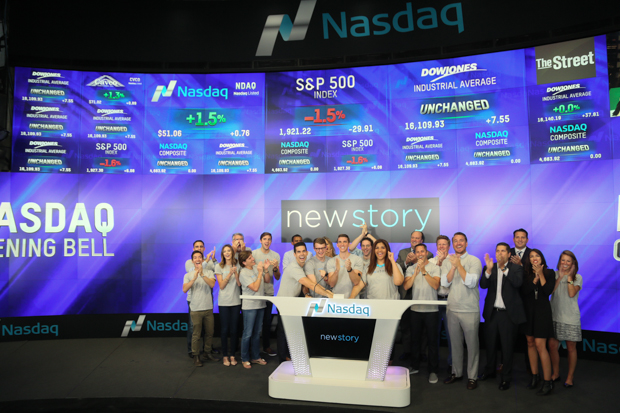 The ringing of the opening bell on September 8 coincided with the last day of New Story's 100 Homes in 100 Days campaign, which ended with a total of 103 homes being funded for families left homeless by the 2010 earthquake in Haiti. New Story's aim is to change the status quo of traditional charities, with a fully transparent platform that lets donors see that their funds are being used to help the people who need aid. Congratulations to New Story founders Brett Hagler, Matthew Marshall, Alexandria Lafci, and the rest of the team! Echo Locker, the startup that makes a popular app for personalizing the lockscreen on Android devices, has been acquired by Microsoft. Echo Locker launched out of YC in our Summer 2013 class as Prim, and later turned its focus to the Echo product in July 2014. In an interview with Business Insider's Matt Weinberger, Microsoft's Chief Experience Officer Julie Larson-Green praised the Echo lockscreen app for helping take "productivity to the next level" and allowing users to stay "in the moment." According to Business Insider, the Echo app will continue to be a standalone product for the time being, though its technology will be incorporated into future Microsoft products: "A lot of what Microsoft comes up with via the Next and Echo lockscreens will make it back to Windows 10, Office, and any other Microsoft product that sends out notifications," Weinberger reported. Congratulations to Echo's co-founders Xuwen Cao and Yin Yin Wu. In the latest episode of YC's Startup School Radio, podcast that features stories and practical advice about starting, funding, and scaling companies, our host Aaron Harris first sat down with his fellow YC partner Qasar Younis. In addition to being YC's newly-appointed COO, Qasar has also founded several companies, including TalkBin, the Winter 2011 alum that went on to be acquired by Google. You can listen to the full hour-long episode on SoundCloud here or on iTunes here. Frederick: What I quickly learned as I was talking to folks [about investing in Pigeonly], there were some biases. One was that they just couldn't wrap their brains around the system, because the problem we were solving was so far removed from what they understood. There wasn't any prejudice or anything against me as an individual, but it was just, 'I literally can't wrap my brain around this problem to even know if it's real or not.' And that's the biggest thing when we talk to most people, is that I have to spend a lot of time educating them on the problem that we're solving, and then we can move forward to even talk about the business. That's how we were able to weed out and find out the people who were interested in it. Aaron: ...So it's been a couple months out of YC, and so just as a parting piece of wisdom, what did you take from YC back to the company that's driving you forward now? Like what's the thing that, for Pigeonly, is the core lesson that you need to keep pushing on that's going to drive your business? Frederick: I think focus. I think focus is highly important, because there's so many things that you can be doing, and it's easy to get distracted. And, also, I think the second lesson for me that's really...we picked up from one of the speakers is focusing on what our driving metric is. So for us it's constant, weekly communication. And we made that the core of our business. We made that the core of our meetings. And now everything we do our question is, 'Is this going to drive more consistent weekly communication for our user base?' And that's really helped us, and helped us make some hard decisions, to really do the right thing at the right time. In Episode 9 of YC's Startup School Radio, our host Aaron Harris first sat down with YC partner Geoff Ralston to talk about his keen interest in funding education startups both at YC and through the Imagine K12 accelerator he founded. In the second portion of the episode, Aaron talked to David Bladow, the co-founder and CEO of BloomThat, the YC S13 company that's been dubbed the "Uber for flowers," delivering organic floral arrangements within 90 minutes. You can listen to the full hour-long episode on SoundCloud here or on iTunes here, and read the full transcript on Genius here. Geoff: It is also true however that [in the past] the job security was much better. If you were a farmer, you stayed on your farm forever and it was very unlikely that you would do anything else in your career. The [current] realities of a lifetime where you will be forced to have multiple careers and multiple expertise, learn multiple things, sort of goes to the heart of why I am interested in education. ...You can't do that unless learning is something that becomes a part of how you do your job, and how you think about your life. Aaron: I guess when you think about being a founder it isn't a single skill set. There is no thing that you go and say, 'Oh, you've learned this, therefore you can start a company.' It's actually an amalgamation of lots of different skills and I think a lot of it is a mindset, the determination that you're going to go do all of those things necessary to make your company succeed. Geoff: I've always been so impressed with people, you see them around you in life and in the workplace, where something comes up that's necessary to do, you would say okay, someone's got to do it, and they say, 'Okay, I'll do it' and then it gets done. They figure out how to make things happen. How to pull together the different threads of creation or whatever they're doing and make it so and that's what a startup is. If you're an engineer when you start a startup you might actually have to be the head communications officer where they have to do radio shows like this, even if you're kind of a geeky guy like I am, or you know, I hesitate to say it, but like you are. And here we are, talking on the radio. You better be able to learn how to do things. But one of the things we've noticed at Y Combinator is that some of the very best enterprise companies that are created by kind of really super smart, super competent, kind of geeky guys who understand how to build software is when they actually learn how to do enterprise sales all on their own. Geoff: Exactly, they seldom have it. But the best ones gain it. It's really impressive. And once they do that, they make for the very very best founders. In the eighth episode of YC's Startup School Radio, our host Aaron Harris first sat down with YC partner Kat Mañalac to talk about her work heading up Y Combinator's outreach efforts, and how she goes about seeking out great founders and companies all over the world. In the second portion of the episode, both Kat and Aaron talked to Urska Srsen, the co-founder and CEO of Bellabeat, the YC W14 company that has built a hardware and software platform delivering quantified self for pregnancy and women's health. Urska: So the idea basically just came very spontaneously. I studied fine art and sculpture before, so I was in no way thinking that I'm going to start a business or work anything related to probably tech... so it just came as a coincidence. We started to work on this project of remote patient monitoring system back in Europe, in Croatia. Aaron: Sorry, I've got to interrupt. How did you happen to be working on the problem of remote patient monitoring? Urska: It just happened over a family lunch. So my mom is a gynecologist and obstetrician and Sandro, my co-founder is a software engineer. So they started talking about these problems in healthcare systems in Europe, and how remote patient monitoring has been a subject that has been talked about a lot but nothing has been done. So we were like, 'Yeah, maybe we can just do it.' It was very naïve. And basically, I got involved as a designer for interfaces and medical data visualizations, and then we just kicked it out. We started working on this project and we didn't even know what direction this was going. We didn't even think of it, that this is going to develop into a company. It was just like, 'We want to do this thing that is going to solve problems in healthcare, that is going to start reducing costs.' We just didn't think that this was going to turn into a business eventually. Aaron: Right. It's funny, I think a lot of the best companies, or certainly a lot of great companies, started out as, 'We don't know if this is a business,' right? And then the business grows out of it. Kat: You're just solving a problem for a lot of people. Urska: Exactly. Then you're not very burdened with it, you're not thinking so much about, 'How are we going to make money out of it' or 'How are we going to position ourselves on the market?' You're just focused on the product. And I think that's very good, especially in the start, when you can easily get just freaked out by everything if you start overthinking things. In Episode 7 of YC's Startup School Radio, our host Aaron Harris first sat down with Kevin Hale, the YC partner and co-founder of Wufoo (W06), the online form building platform that was acquired by SurveyMonkey in 2011. In the second half, he talked to Johnny Chin, the co-founder and CEO of Bannerman, the company that provides on-demand security staff and bouncers. Aaron: So on the one hand, it sounds like you followed this core precept, which is so important, of talking to your users and finding out what they need. On the other hand, you weren't really building something for yourself anymore. Was that hard to reconcile or hard to get around? Or did it just make so much sense that, okay, of course that's what we go and do? Aaron: Did you start dressing differently, talking differently, you know, all that? Aaron: So you kind of inhabit this mindset of someone who will need to hire a security professional, and you start talking to them all the time. What were these features that you started adding, that you realized that people really needed? Johnny: Surprisingly, it's actually taking away features. That is really the most important thing. To take away features, and when a user doesn't complain, then you're on to something. Earlier on, with my four failed companies, it was always about adding more, adding more, adding more. 'Let's add this social hook' or 'Let's add this button here.' But it turns out with Bannerman, we did the exact opposite. And that proved to be quite interesting.